There are times when I find the sheer size of this shop/house quite daunting and long to have at least some tiny corner of it done! The smallest space is the loft up at the very top, and so I decided this could be the first place to attempt a finished look. It's basically a single strip of floor with a hatch cut into into it for access - and most importantly, for young Frankie Brennan to reach the leaky old water tank whose pipes regularly freeze up in the winter. 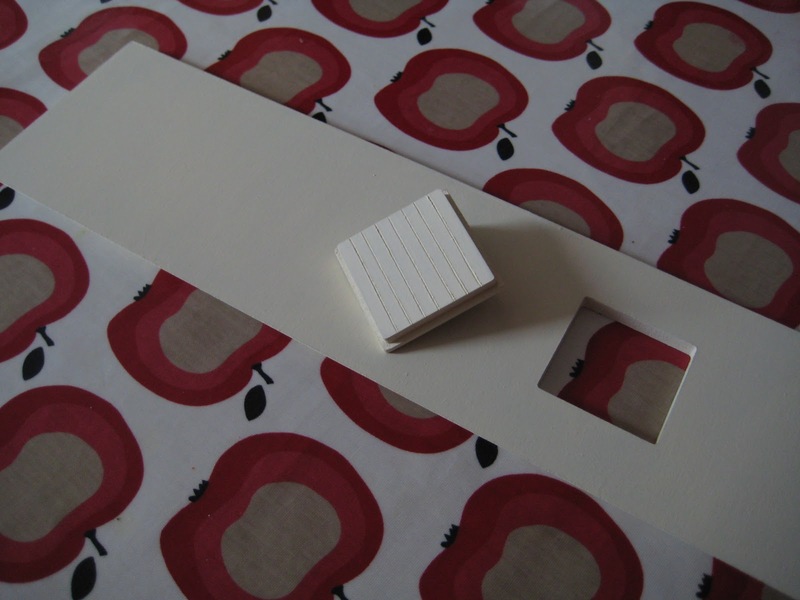 The bench hook is a really handy device for pushing a piece of wood against while you are cutting or chiselling into its surface. In this case, I was cutting parallel lines into the MDF hatch cover with the V-shaped blade of a lino-cutting tool. As you can see, the bench hook itself simply consists of three wood offcuts screwed together at right angles to each other. It makes working with a blade far steadier and safer. Lightly sanding a newly painted surface is an easy way of distressing an item but don't get too carried away and overwork the effect. 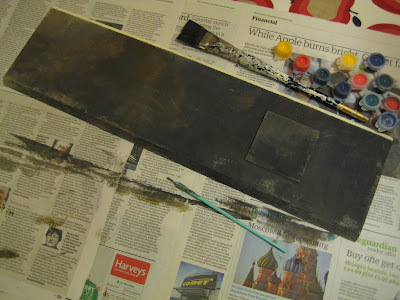 And for a nice bit of dirt, I find that mixing odds and ends of poster (gouache) paints together produces a satisfying shade of sludge (if you don't have any old paints you can just as well use inexpensive children's water colours). If the old paints have dried out in their pots add a little hot water and leave them to soften a while. I like using gouache because it has good covering power and dries to a matt finish. 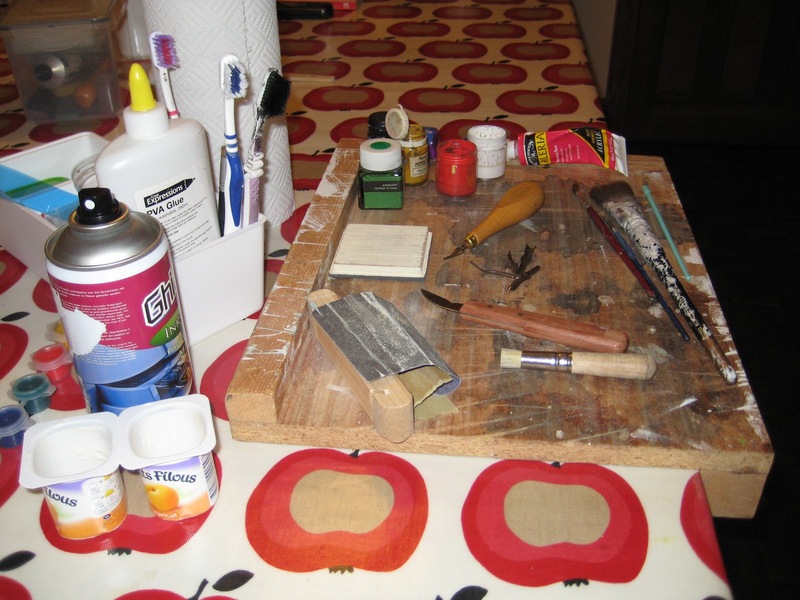 You can create your own special effects too, for example, by spraying varnish into the wet paint or pressing crumpled tissue or kitchen roll into it. All sorts of brushes are welcome for distressing, don't throw any away unless they are completely without bristles. Toothbrushes are great for scrubbing and splattering paint. One of my all-purpose favourites is a flat, wide, nylon brush that washes out easily and never sheds any hairs. 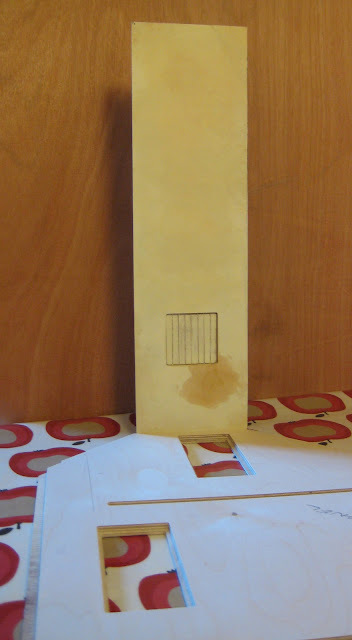 I began by painting the underside of the loft section with a matt ivory from a 40 ml tester tube. The old water stain from the leaky tank was produced with a wet tea bag and a handful of kitchen roll. The stain was created in stages and allowed to dry each time. 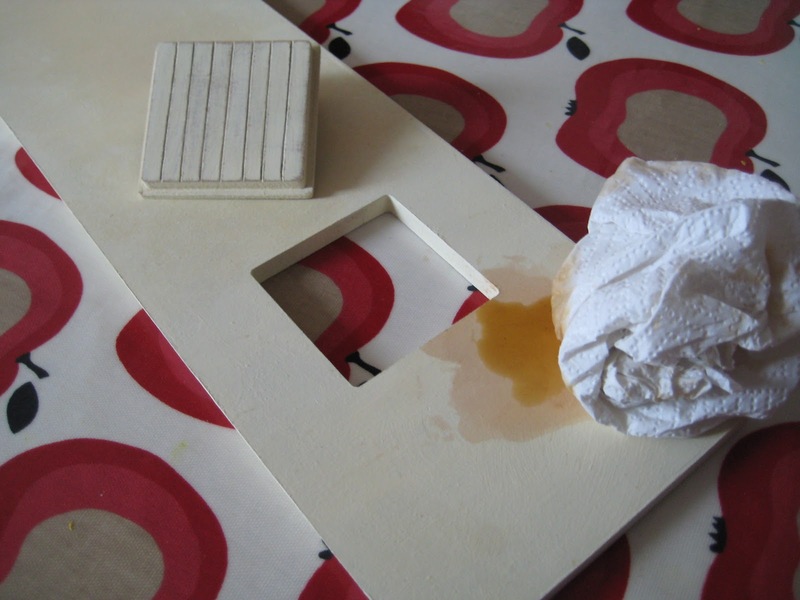 You can change the shape of a stain by tilting the surface this way and that so it spreads. If it appears too dark then soak up the excess tea with a paper towel. The rest of the ceiling extends over the lodger's bedroom. The lodger is a smoker and so I wanted to yellow it just a bit. 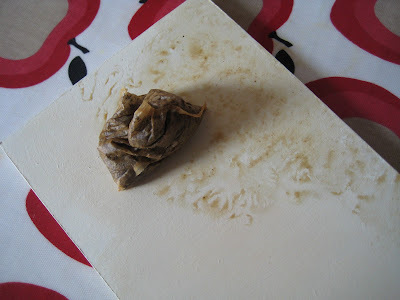 I took another wet tea bag, squeezed it out a little and rolled it over the clean paint layer. You could leave these marks to dry as they are, but I only wanted a hint of nicotine yellow so I blended the tea into the background by rubbing with the kitchen roll. Finally, I slotted the loft piece into the top of the side panel to see how it looked. I'll have to reproduce the same colouration inside both sloping roof sections but I've kept the tint technique simple enough to repeat (I hope!). 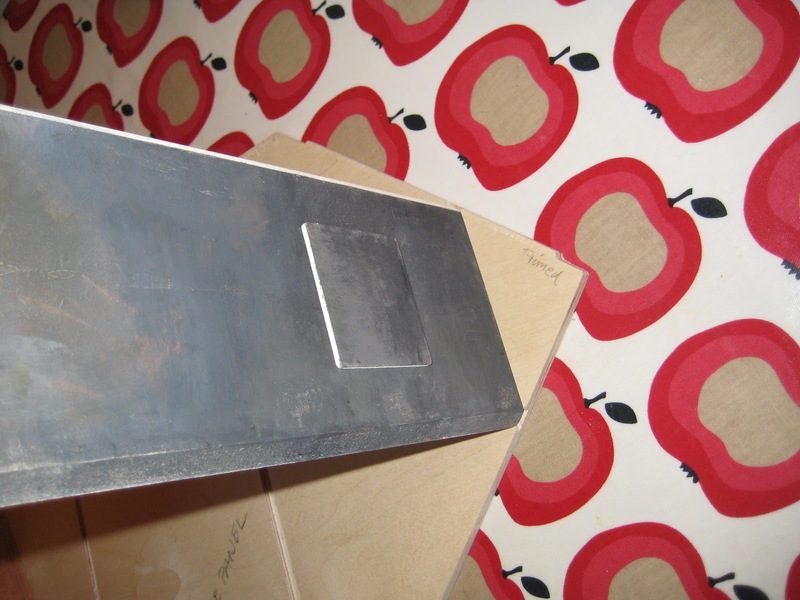 The top side of the strip forms the loft floor and was treated to a few swirled layers of the 'sludge'. I don't know yet if I'm going to add joists. However, the water tank is in progress, that will eventually sit to the right of the hatch, over the horrible stain. This rather dramatic angle shows how tight a space I have to fit the tank into! Last week I promised that I would show you some more of Anne Dalton's ceramics. Here are four of them, including the posy vase, a candlestick and two beautiful examples of painted fruits. 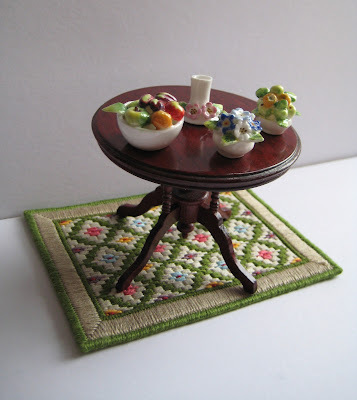 The rug was embroidered by a friend, the colours are perfect with the china, I think. Next Saturday, 24 November, is Kensington's long-awaited Christmas Festival. I have a few interesting orders to collect, but more about those next time . . .